Farming is complex enough. When it comes to your customers running precision management strategies that are tailored to address variability among their field, things can get downright chaotic. Even if you’ve managed to coordinate data coming in from several different apps, are the formats consistent? Is it syncing properly? Once you’ve prepared the crop plans, is it easy to share among your clients or other members of your team? Unfortunately, there are usually more questions than answers. Yet, the most important question is: Should it be this hard? It doesn’t have to be. 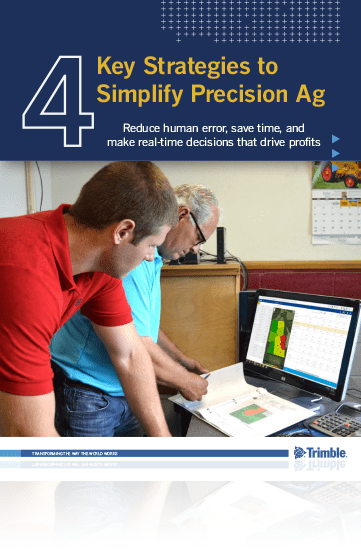 This eGuide outlines four key strategies for simplifying precision ag management across your customer’s entire farm operation of business with the assistance of Trimble’s Advisor Prime platform. Download this eGuide and start streamlining precision workflows, while driving bottom-line profits.